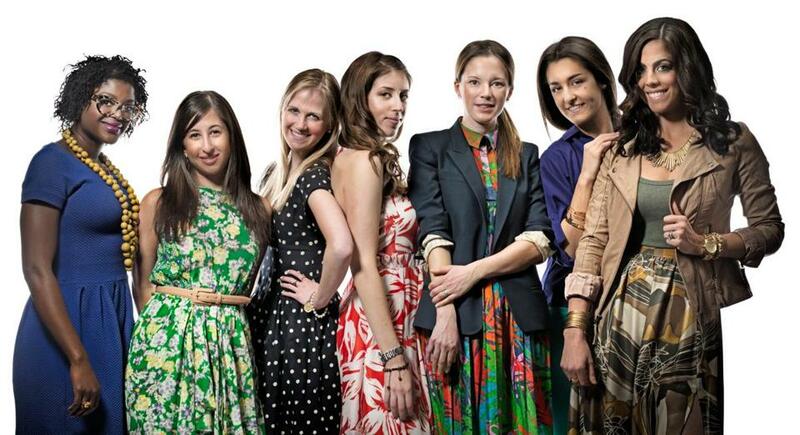 The style-blogging community is alive and well in Boston. From left to right: Martini Severin, Marissa Berenson, Emily Geaman, Courtney Mirenzi, Liana Krup, Zoe Malliaros, Erin Gates. SHE’S WEARING Ganni dress from Anthropologie, Elk wood bead necklace from Australia, glasses from See. SHE’S WEARING Rebecca Taylor dress and patent belt, both from Neiman Marcus. SHE’S WEARING Anthropologie dress and her grandmothers’ bracelets. SHOPS AT Lit Boutique, Mint Julep, Jack Wills. BLOGS ABOUT Beauty, fashion, and being married, all with a stand-up-and-believe-in-yourself bent. SHE’S WEARING Rafaella dress “from the sale rack” and her grandfather’s watch. HER SPRING LOOK High-waisted jersey-knit skirts and a tee. BLOGS ABOUT The style scene in Boston — “it’s emerging from its historically tweedy and puritanical style” — highlighting local style makers, new brands, and what’s on sale in area boutiques. SHE’S WEARING Suno dress from Stel’s, Etoile Isabel Marant blazer from Alan Bilzerian. SHE’S WEARING Collective Concepts blouse in royal purple, Joe’s Jeans turquoise skinny jeans, Alex and Ani bangles. BLOGS ABOUT A fan of mixing high- and low-end pieces, the stylist and interior designer writes about both fashion and home decor, including the looks she craves. She also offers red carpet critiques. SHE’S WEARING Rachel Zoe maxi skirt, Guess faux-leather jacket, J.Crew necklace, Michael Kors watch, vintage bangles.